I recently read this and, aside from having TONS of thoughts (in agreement – and which I will write about later), I also came across a few comments that basically said “yea, well how DO I find a stylist that’s right for me? !” And I wanted to repeat here what I said in the comments there, because I think it’s really useful information that may not be obvious to someone outside the industry. There are a couple tricks to finding a stylist who is a perfect fit for you. Some of it is just trial and error: finding the perfect stylist can be a sort of Goldilocks-like quest. 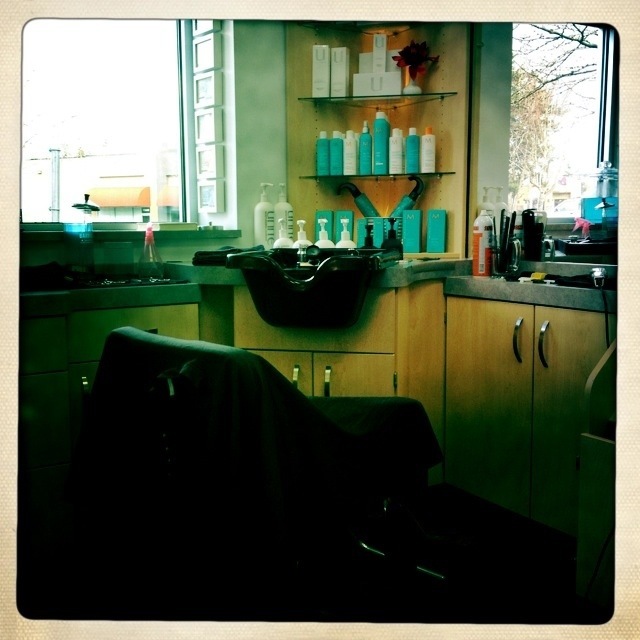 Even if you find a salon you like, it might take a couple visits before you find the right stylist for you. 1. Look for someone who has a similar hair type to you and is sporting a desired style and ask them where they got it done. This one is easy – especially if you ask them about their routine and find it’s similar to what you are hoping for. 2. Look for salons that appeal to you aesthetically. The way a salon is designed and decorated says a lot about the type of clientele they want to attract, the amount of money they want you to spend, and how much maintenance they expect you to put into your hair. For example, a super modern salon in the center of a bustling downtown with front desk staff that consists of 2 or more people likely denotes a higher-maintenance styling philosophy. Whereas a salon set in a converted house in the arts district that carries all organic hair care lines is going to denote a more easy-going styling mentality. 3. That said, a good salon will have all types of stylists to serve all types of clients (and a good stylist can serve all types of clients, even if they themselves are higher or lower maintenance with their hair or overall look). So another good idea is just to call a salon that looks interesting and ask. Do not ask “who is the best” as that question is an affront to stylists and meaningless if the person on the other line knows nothing about you – but ask who works with your hair type the most, or explain that you want a certain look and ask who would be a great fit. Don’t be afraid to tell them you are looking for a great fit, they will want to help you find it so you stay at their salon. 4. Look for a hair product line that has a similar philosophy towards haircare as you do and then find salons that carry it exclusively. For example, any salon using organic color is going to have similar ideas about hair in general. A salon that carries Davines or Aveda, both lines that emphasize natural ingredients, will (generally) be more low-key. But a salon that carries Kerastase, Oribe, Kevin Murphy, etc. is going to be for a client that is into doing a lot of styling. 5. Look for a stylist who looks like you. Again, a good stylist will be able to do all types of clients hair, but finding a stylist with a similar personal style and taste to you can help you find someone who not only will get what you are going for, but also might be a really great fit in terms of personality. Similarly, a curly haired stylist knows how to deal with curly hair because she’s been dealing with her own her whole life and you can bet she had an awful cut or two before she became a stylist. Obviously, you’re going to find salons that carry one or other of these product lines, have stylists who look like you, or appeal to you in terms of design and they may still not be what you hoped. Again, it’s a little bit of trial and error with this sort of thing. The more of these things match up, the higher your chances of success – but sometimes it just comes down to personality. You might find someone who does your hair well, but that you feel no connection to, and this may or may not matter to you. But I hope everyone finds a stylist who truly “gets” them and their hair – a great hairstyle is a seemingly small thing that nonetheless can have an outsize impact in our lives, making us feel beautiful and more confident, or simply making life easier. Good luck!